Click here to view our Dan Grade Theory Documentation. People under 16 years of age may be graded up to 1st Dan only, and be known as a junior Dan grade. Once they reach 16 years of age with their group heads recommendation to the Wado-UK they will automatically have their grade converted to Senior status and be registered with the governing body. A physical grading is required up to 4th Dan level. 5th Dan and above is awarded for services to Wado-UK and when all the other Dan grade criteria is met. Recommendation must be made to the Wado-UK technical board for consideration. 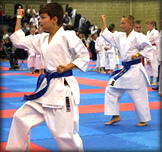 No grading can take place or be registered unless properly constituted by the Chief Instructor of Wado-UK. Grading panel to wear uniform. All gradings must be fully recorded. All Dan grades must be conducted by recognized Dan grade examiners of at least 2 levels above the grade being taken. If this rule cannot be met, then the Technical board must be consulted. All prospective applicants for Shodan must be established as part of the Wado UK organisation team. This means they must be established or in the process of gaining qualifications in competition marshaling, table official duties, and or judging. * For those who have their own group within Wado-UK and wish to do their own Dan gradings then the above rule of at least 3 (Wado-UK) members of 3rd Dan still applies and a syllabus must be submitted to the Chief Instructor of Wado-UK for acceptance at least 1 month prior to the grading. Any groups who do not adhere to the rules on grading will not have the grading recognised. Current maximum cost of a Dan grade is £40-00 for both junior & senior plus £20-00 registration fee if successful which includes the plain cotton black belt and certificate. Black belts can be silk or cotton with Kanji in any colour, stripes indicating Dan grade are not normally worn in Wado, but are allowed.